Plate 20 from the first set of Thomas Daniell's 'Oriental Scenery.' The Daniells wrote, 'This view of Rotas Ghur was taken nearly at the top of the mountain within the works. A temple of the Hindoos, with a considerable flight of steps, formerly crowned the eminence on the left; the upper part of which has been thrown down by the Mahommedans, who erected a mosque near to it, and which in its turn is also become a ruin. No inhabitants are now to be found within the extensive walls of this magnificent fortress.' 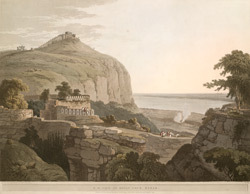 The ruins of the ancient temple of Rohitesvara crown the bluff, approached by its great stair, while the five-domed temple of Harsichandra may be seen beyond. The ancient and vast fort of Rohtasgarh is perched on top of the Kaimur Hills where they approach closest to the river Son in south Bihar.